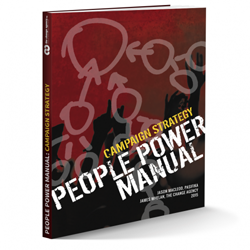 The Campaign Strategy Guide is the first instalment of the People Power Manual, a resource created for activist educators and facilitators. Campaign strategy needn’t be mystifying, lonely or stressful. Social movements become more powerful as more people are equipped to analyse their political context, consider paths to change and mindfully plan tactics. The Campaign Strategy Guide equips activist educators to facilitate a range of participatory exercises with activists, organisers and citizens. It can also be used as a do-it-yourself guide for campaigners. The guide incorporates 16 handouts, several workshop schedules and process guides for 24 strategising processes that have been tried and tested by thousands of campaigners. The Campaign Strategy Guide will be launched during the Organise conference in Sydney on 25 September. The People Power Manual is an initiative of Pasifika and the Change Agency.